PRODUCT: 1/4 in. X 1 inch Long Zamac Nailin Concrete Anchor. Mushroom-Head Zamac Body with Zinc Plated Carbon-Steel Nail. For Concrete, Block or Stone. Powers Brand. 1000/Box. Price/Box. 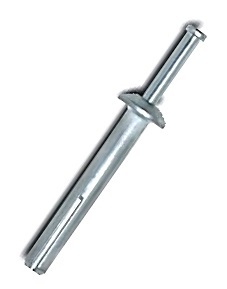 DESCRIPTION: The Zamac Nailin® is a tamper-proof nail drive anchor which has a body formed from Zamac alloy. Anchors are available with nails are available in carbon or stainless steel. The anchor can be used in concrete, block, brick or stone. This anchor is not recommended for applications overhead. SELECTION: For mushroom head Zamac Nailin anchors, the anchor length is measured from below the head while the flat head version is measured end to end. To select the proper minimum anchor length, determine the embedment depth required to obtain the desired load capacity. Then add the thickness of the fixture, including any spacers or shims, to the embedment depth.